Be the first to share your favorite memory, photo or story of Ferrol . This memorial page is dedicated for family, friends and future generations to celebrate the life of their loved one. 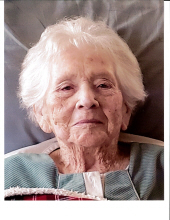 Ferrol Lorene Davis, of Rolla, passed away Monday, January 28, 2019 at the age of 98. She was born in Phelps County on March 9, 1920 to the late Harry and Minnie (Christesson) Loughrige. On June 22, 1939, she married Wilbur Davis who preceded her in death on October 4, 1991. Ferrol was a member of the New Home Baptist Church. Among her many interests, she enjoyed gardening in her vegetable and flower gardens and baking and decorating cakes. In addition to her parents and husband, Mrs. Davis was preceded in death by one brother, Merlin Loughrige, and one sister, Melba Jones; brothers-in-law and sisters-in-law, Wilson and Opal Davis, Raymond and Jean Davis, Edmond and Fern Davis, Leonard and Eunice Davis, Everett Daniels, Gene and Eula Gabel, Thelma Loughrige, Claude Jones, Roberta and Floyd Roberts. She will be greatly missed by her surviving family which includes three sons, Gary Davis and wife Karen, of Rolla, Kirk Davis and wife Linda, of Newburg, MO, and Keith Davis, of Rolla; nine grandchildren; nineteen great grandchildren; twenty-three great-great grandchildren; several step great-great grandchildren; one great-great-great grandchild; two brothers-in-law, Lester Davis and wife Betty and Larry Davis and wife Roberta; two sisters-in-law, Dorothy Daniels and Rosemary Chambers and husband Don; a host of nieces and nephews; other extended family members and dear friends. A funeral service for Ferrol Davis will be held at 11 am Saturday, February 2, 2019 at the Null and Son Funeral Home in Rolla. Interment will follow in the Ozark Hills Memorial Gardens Cemetery in Rolla. A visitation for family and friends will be held from 5-8 pm Friday, Feb. 1st at the funeral home. Memorial contributions are suggested to the New Home Baptist Church or the Mt. Olive Cemetery. To send flowers or a remembrance gift to the family of Ferrol Lorene Davis, please visit our Tribute Store. "Email Address" would like to share the life celebration of Ferrol Lorene Davis. Click on the "link" to go to share a favorite memory or leave a condolence message for the family.